Albright College's Drew Peterson (Bristol, Pa./Harry S. Truman) and Daniel Sobolewski (Linden, N.Y./Linden) have been named to the 2013 BSN Division III All-America football team. Peterson, a senior safety, was a second team selection while Sobolewski, a sophomore kicker, was named honorable mention. A first team All-MAC and D3football.com All-Region selection, Peterson tied for first in the nation with eight total interceptions. He had 133 return yards and a TD off those interceptions and added eight pass breakups for 16 passes defended. Peterson had 46 tackles (26 solo) on the year, with one for loss. He totaled two interceptions vs. Kean, earning a spot on the D3football.com Team of the Week. He also had two picks and returned one for a touchdown at FDU-Florham- his fourth career multi-INT game. On special teams, the senior totaled 242 kick return yards (12 returns) and 116 punt return yards (17 returns). He concluded his career with 16 interceptions and four TD returns (3 INT, 1 punt). He is a finalist for the Cliff Harris Small College Defensive Player of the Year award. Sobolewski made 15-of-23 field goals and 43-of-45 PATs. He was fifth in the nation in field goals made. He averaged 58.7 yards per kickoff with 19 touchbacks (62.2 yards per kickoff over 63 attempts, besides 10 onside/designed short kickoffs). The sophomore made the three longest field goals in school history, equaling his previous year's record of 47 yards in the ECAC Southwest Bowl vs. Juniata, while making from 51 (vs. Stevenson) and 49 yards (vs. Widener). He was named a BSN National Special Teams Player of the Week and to the D3football.com Team of the Week twice each- after making 3-of-4 field goals vs. Kean, and following a 4-of-5 performance against Widener. A three-time MAC Special Teams Player of the Week, Sobolewski was also named first team All-MAC and third team D3football.com All-Region. He was named to Mitchell Award Recognition List (for the nation's top collegiate place-kickers among non-FBS schools) in both September and October. 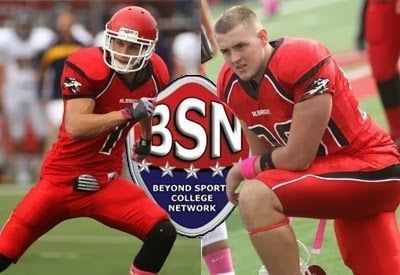 Albright has earned five BSN All-American selections since the website began publishing a Division III team in 2011. Peterson (who was a third team BSN Preseason All-American this year) and Sobolewski join Scott Pillar (WR, 2011, 2012) and Marty Reinhardt (FB, 2012). Six Middle Atlantic Conference players made this year's All-America team. Widener wide receiver Anthony Davis (first team) and safety Colin Masterson (honorable mention) were both included, along with Lebanon Valley linebacker Frank Gaffney (second team) and Lycoming safety Tanner Troutman (third team).